How many people were healed in Branham's meetings? "...no one dared to raise a voice against William Branham while he was alive. Everyone was afraid of the "angel of the Lord" that stood with him and his critics only raised concerns against him after his death". Followers of the message believe William Branham to be the greatest prophet since Paul and one of the greatest prophets that ever lived. If this is the case then one would expect that his healing ministry would be similar to that of Jesus or the apostels. And he went throughout all Galilee, teaching in their synagogues and proclaiming the gospel of the kingdom and healing every disease and every affliction among the people. So his fame spread throughout all Syria, and they brought him all the sick, those afflicted with various diseases and pains, those oppressed by demons, those having seizures, and paralytics, and he healed them. That evening they brought to him many who were oppressed by demons, and he cast out the spirits with a word and healed all who were sick. God anointed Jesus of Nazareth with the Holy Spirit and with power. He went about doing good and healing all who were oppressed by the devil, for God was with him. The people also gathered from the towns around Jerusalem, bringing the sick and those afflicted with unclean spirits, and they were all healed. And when this had taken place, the rest of the people on the island who had diseases also came and were cured. Controversy surrounded Branham right from the start of his public ministry. 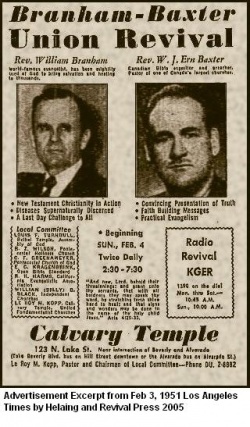 In 1947, a minister in Saskatchewan, Rev. Alfred Pohl, stated that many who Branham pronounced as healed later died. ...his question still hit me very hard. "Brother Pohl," he said, "you were there beside my wife's bed the night Mr. Branham prayed for her and pronounced her healed?" "Yes," I replied, " I was right there." He went on, "Can you tell me why it is that my wife who was healed just a few days ago is now in the grave?" My friends, I believe that was one of the hardest questions that I was ever called upon to answer! My heart went out to this dear brother. I felt with him. But how could I answer him? ...Mr. Branham pronounced her healed. Again there was much rejoicing. I remember that the pastor handed me a cheque of a sizable sum of money to pass on to Mr. Branham. As he did so, he remarked that he couldn't afford to give that much, but that Mr. Branham deserved it because his wife was now healed, and he had spent thousands of dollars on doctors that didn't help her. It was several weeks later... when in the vicinity of this pastor's home city, I made inquiry as to his wife's state of health, only to be told that she too had passed away. What a blow that must have been to that dear brother? But that was not all. I was told that he had a good radio ministry in his city. When he had returned from the healing meetings in Saskatoon, he announced over his radio broadcast that his wife had been wonderfully healed. However, just a short while after that he had to inform his radio audience that his wife had died. I was told that it dealt a severe blow to his radio ministry. My friends, what kind of a testimony is this to the world? To them it "does not add up." And there is something wrong! Did this pastor's faith fail? Let me ask, did this sort of thing happen to those who were healed by the Lord Jesus or by His apostles? Where, then, is it recorded? As Christians we sometimes think that we're "charitable" if we overlook these things, but is this real "charity" or love? Is it loving to permit this type of thing to be carried on in our churches, to the needless suffering, agony, disappointment, and expense of the sick? And more importantly, is it scriptural not to deal with the false, the counterfeit? (see Titus 1:7-14). In 1948, W.J. Taylor, a district superintendent with the Pentecostal Assemblies of Canada, raised the same concern. He and his executive asked for a thorough investigation, presenting evidence that claims of the number of people healed were vastly overestimated. While he expressed warm regard for Branham as a person, he stated, "I firmly believe that there is a possibility that this whole business is wrong". He possessed an extraordinary diagnostic gift and could identify the illnesses (sometimes even the names) of persons he had never seen. Unfortunately his healing prognosis was accurate only in rare cases. The excuse of healing evangelists in such cases has always been: The patient did not really believe; for they were convinced that faith leads automatically to health. ...it must be admitted that his sermons were not merely simple, but often naive as well, and that by contrast to what he claimed, only a small percentage of those that sought healing were actually healed." There was, we was having day service. And there was just hundreds of people coming in the line, being healed. Now, it's brought to pass. I hate to say this. God have mercy. Look, friends, down through the rest of the country, over in Phoenix, over in Houston, over in San Antonio, down in Arkansas, down across the country, thousands are being healed, coming through there, of all kinds of sickness and diseases. Oakland, know your day. Well, I'd say twenty-five or thirty-five thousand people, prayed for, maybe more than that. And there's been at least ten thousand of them healed. Would you think of that? Such as cancers that are laying at their last moment, are well people since the last meeting. I guess, in the--in the--the provinces of Canada alone, there was at least two hundred and fifty, or maybe more than that, cases of cross-eyed people with their eyes straightened. And mutes, it's innumerable to count them, for there was multiplied scores of them that came, that were some deaf, dumb, some hard of hearing and everything that were made perfectly whole. Now, that's only done through the visitation of the Angel. ...You're healed, sir. God bless you. Well, you should go home now, rejoicing, sister, 'cause you're healed. God bless you. Let's say, "Praise the Lord," everyone. That's mighty fine. All right, you're healed. Your other disease cured, you're well. Go home and rejoice. Let's say, "Praise the Lord," everybody. ...See this man here? You know what's happened to you? You're healed, in the Name of the Lord Jesus. All you can raise your heads. There's the girl. Let's say, "Praise the Lord," everybody. ...Let's say, "Praise the Lord." There it is, you see that? God loves you, you're healed. Amen. Praise the Lord. ...the deaf and dumb spirit has gone from us, in the Name of the Lord Jesus Christ...?... You're healed. God bless my sister...?... in Jesus Name. Young lady, you was healed when you walked to this line. Friends, I want you to open your eyes. I... This is the... I--I've said it was a poorest place for faith, but I believe it's greatest this afternoon. This girl was healed before I took hold of her hand. Just... I felt something move, and the girl was healed. A strange feeling come to you, didn't it? You're healed, young lady. All right. You mark my word and see if that isn't right. Glorify the Lord. Everybody that truly believes gets well. Thousands have been healed. ...Then you would ask me, "Does everybody get well, Brother Branham?" Everybody that truly believes gets well. Thousands have been healed. And, friends, look. It's just not Tallahassee; this has went around the world. See? Everywhere, literally tens of thousands and thousands and thousand times thousands of people healed and saved and filled with the Holy Spirit and...?... See? It's not nothing. It's been tried under every fiery trial, I believe it can be put before, and all. Here's my manager? Is that right, Brother Baxter? Through everything. And always, God is triumphed, never failed one time and can't fail 'cause it's God. ...twenty-five thousand healings, one prayer. I seen about, oh, I guess thirty or forty thousand healed with one prayer. That's right. Was everyone healed that William Branham prayed for? Based on the testimony of independent observers, the answer is a clear "no". Were as many healed as William Branham claimed? Again, based on the testimony of independent observers, the answer is also an emphatic "no". William Branham made the excuse for himself for the vast majority of those who were not healed that they simply did not have faith. And those whom he proclaimed to be healed could lose their healing if their faith faltered. It is also clear that this is not the biblical pattern. ↑ The Holy Bible: English Standard Version (Wheaton: Standard Bible Society, 2016), Mt 4:23–24. ↑ The Holy Bible: English Standard Version (Wheaton: Standard Bible Society, 2016), Mt 8:16. ↑ The Holy Bible: English Standard Version (Wheaton: Standard Bible Society, 2016), Mk 6:56. ↑ The Holy Bible: English Standard Version (Wheaton: Standard Bible Society, 2016), Lk 6:17–19. ↑ The Holy Bible: English Standard Version (Wheaton: Standard Bible Society, 2016), Ac 10:38. ↑ The Holy Bible: English Standard Version (Wheaton: Standard Bible Society, 2016), Ac 5:16. ↑ The Holy Bible: English Standard Version (Wheaton: Standard Bible Society, 2016), Ac 28:9. ↑ Kydd, Ronald A. N. (1998). Healing through the Centuries: Models for Understanding. Hendrickson Publishers, Inc. ISBN 0-913573-60-4. ↑ Hollenweger, Walter J. (1997). Pentecostalism: Origins and Developments Worldwide. Baker Academic. ISBN 978-0801046605. This page was last edited on 13 May 2017, at 16:56.